Thank you Siam Twist for another great night. Food was superb, service spot on and reasonably priced. Keep this up Siam Twist and you will be competing with the big gun restaurants of Canberra. Blessed to have you as our "local". Well done Andrew and co. Apologies in advance are probably in order here, as I inflict the well worn café and restaurant mantra of fresh, local, seasonal produce, on you again to describe these dishes. This concept is not new or unique and producers from the world over have been working with seasonally available produce for ages, actually, forever. In these recipes I also incorporate one of the most basics of preservation techniques, smoking, used to preserve the spring produce through leaner times. In this instance, this is not used to preserve, but to add flavour. In making the most of the sweet spring produce available at this time of year and the smoking for flavour, makes for a light, spring lunch, evocative of the Mediterranean. As in the Mediterranean, I was fortunate to produce my own backyard crop for the choicest and sweetest peas, broadbeans, mint and citrus that were ready to harvest, bang on time for a family birthday feast. While preparing the vegetables, I am captivated by the soft, fluffy green papoose of the broadbean pod that protects its offspring, keeping it in perfect condition. And the verdant greens of the mint, coriander and peas have not yet been yellowed off by the sun. This time of year really is the height of food perfection. For a low fuss feast, throw together these ingredients with some smoked new season lamb, and few embellishments are needed for a gorgeous Mediterranean inspired spring lunch. To smoke the lamb and lemons I used a simple smoking technique using a kettle barbeque with hot coals and hickory chips available at most hardware shops. 500g broadbeans, unpodded. If fresh broadbeans are not available use frozen. Preheat the oven to 180C. Line an oven tray with baking paper and place chopped pumpkin on the tray drizzled with olive oil, and sprinkled with allspice, salt and pepper to taste. Bake for thirty minutes and then scatter the pumpkin seeds over the top and bake for another five minutes or so until the seeds are roasted. Remove from the oven and set aside to cool. To make the paste, heat the oil in a small saucepan over a medium to low heat. Add the cumin, ground coriander, paprika, turmeric and garlic. Cook, stirring for one minute. Remove from the heat and add the lemon juice, fresh, chopped coriander and parsley. Stir to combine. Smear half of the paste onto the cutlets to marinate and set the remainder aside. Prepare the broad beans by cooking in a medium saucepan of boiling water for three minutes. Drain and refresh in cold water and drain and cool. When cooled, peel off outer shell and reserve the inner beans. Gently smash with a potato masher, still leaving a coarse texture. 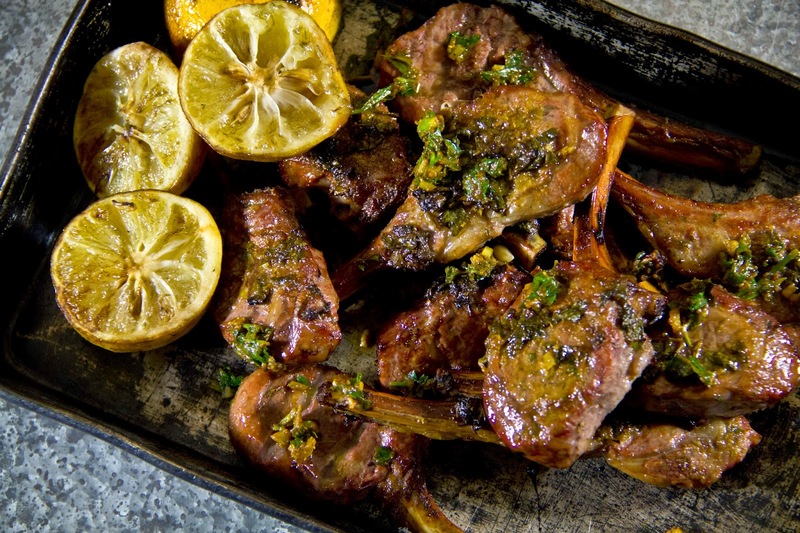 Any smoker can be used to smoke the lamb cutlets. I use a simple kettle barbeque using hot coals cooked down for a few hours with the kettle lid placed on it. Spray the cutlets with a light spray of olive oil. Place the cutlets on a greased wire rack that sits over a disposable foil tray with a handful of hickory chips spread over the base. The foil tray should sit on the kettle rack in the barbeque with the hot coals underneath it. Place the lid on the preheated kettle barbeque and leave the vent slightly open. The cutlets should take about thirty minutes to cook. They will turn a dark red on the outside and just pink on the inside. For well done lamb return to the heat for about another ten minutes or cooked inside when checked for doneness. To assemble the dish, combine the pumpkin, broad beans, fetta and coriander in a bowl with a dash of olive oil and the lemon juice. Divide among serving plates and top with the lamb cutlets and dolloped with the remaining paste. Preheat smoker or barbeque and place lemon halves over a grill with a smoking wood below. I generally use hickory chips. Smoke for fifteen minutes or until the lemons appear golden and caramelised. They should be softened. If you are cooking this complete meal with the smoked lamb, you can smoke the lemons at the same time as the lamb. Shell the broad beans from the outer pod and cook the beans in a pot of boiling water for two minutes. Remove the beans with a slotted spoon and reserve the water for the peas and set broad beans aside. Shell the peas and cook for two minutes in the broad bean water. Drain the peas and set aside. Shell the cooked broad beans. In a food processor, pulse the broad beans, peas, mint half the pecorino cheese, garlic, olive oil and juice from one smoked lemon in a food processor for only a few seconds to achieve a slightly chunky mixture. Season to taste with salt and pepper. Preheat oven to 200C and spray the flatbreads lightly with olive oil on both sides. Sprinkle with a little salt and the herbs. Cook in the oven on a rack over an oven tray for about ten minutes or until golden and crisp but not burnt. 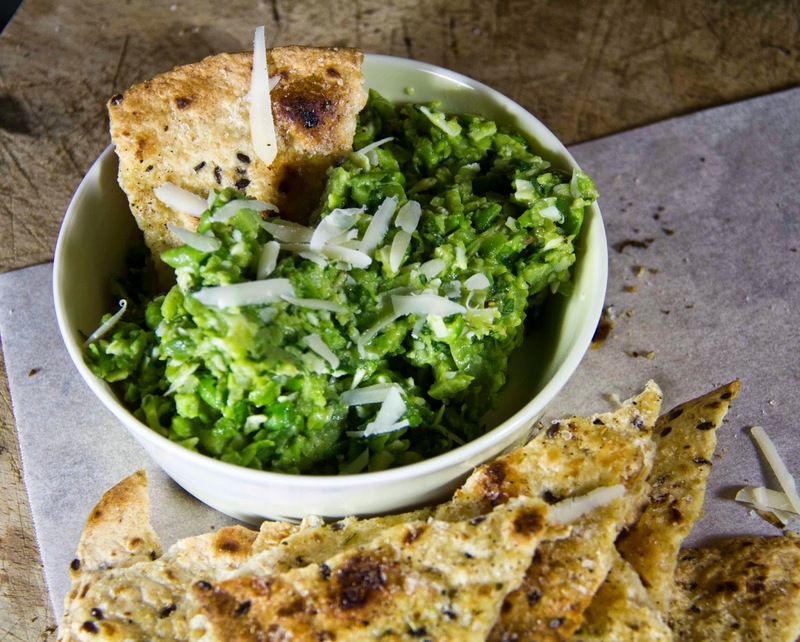 To assemble, break the flatbreads into shards and pile on the broad bean and pea topping, serving with extra grated pecorino, a further drizzle of olive oil and the remaining smoked lemon cut into halves again.